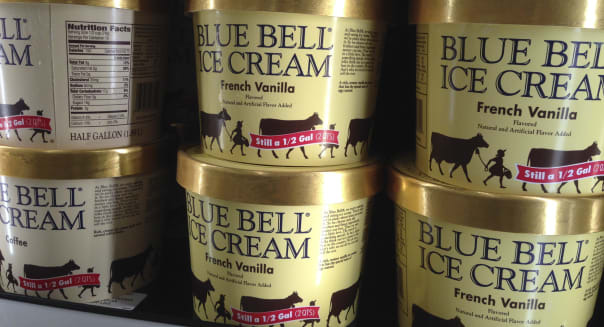 DALLAS -- Texas-based Blue Bell Creameries announced Monday a voluntary recall of all its ice cream and frozen treat products from store shelves due to continuing problems with Listeria bacteria. The move is the most recent in a string of recall announcements by the 108-year-old company, based in Brenham, after health officials said last month three people made ill by Listeria between January 2014 and January 2015 had died in a Kansas hospital where Blue Bell frozen treats were served. %VIRTUAL-pullquote-We are heartbroken about this situation and apologize to all of our loyal Blue Bell fans and customers.%Monday's decision came after the bacteria was detected in Chocolate Chip Cookie Dough ice cream samples that were tested last month. The products being recalled are distributed in grocery and conveniences stores and other retail outlets in 23 states and some international locations. "We are heartbroken about this situation and apologize to all of our loyal Blue Bell fans and customers," Blue Bell CEO Paul Kruse said. "We're committed to doing the 100 percent right thing, and the best way to do that is to take all of our products off the market until we can be confident that they are all safe," he said in a statement. The U.S. Centers for Disease Control and Prevention said Listeria monocytogenes are organisms that can cause serious infection and can be deadly for newborns, elderly people and those with weak immune systems. Healthy people may suffer short-term symptoms such as high fever, nausea, abdominal pain and diarrhea. Five people in Kansas and three in Texas have been treated after testing positive for the bacteria and were linked to Blue Bell products, according to the CDC. Blue Bell also said it would introduce additional safety and testing procedures.